The Shopping Mall in GTA III. The Liberty City Shopping Mall, Staunton Island Shopping Mall or simply The Shopping Mall is a mall located in Staunton Island, from Belleville Park and Newport. Appears in Grand Theft Auto III, Grand Theft Auto Advance and Grand Theft Auto: Liberty City Stories. It is a rather attractive for Liberty City, especially after dark, it is the meeting point for major political figures of the city, there are plenty of advertising, radio , products, among others. Unfortunately , the mall is not accessible in any version, there is only one situated in central path in which you can pass with a vehicle or simply a foot. 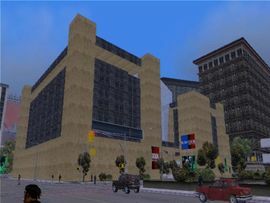 This mall is one of the financial hearts Liberty City in deliveries Grand Theft Auto III, Grand Theft Auto: Liberty City Stories and Grand Theft Auto Advance. Also on screens large and will report economic activity some news going from the advance agreement of the player, among other things. "GTA III FOR SALE!" or "GTA III ON SALE NOW! ", among others. Aerial view of the mall in GTA III. This page was last modified on 21 December 2010, at 21:00.